David Schlemko's deal was arguably one of the ''smarter'' signings this past summer. Sharks' GM Doug Wilson addressed his team's biggest need: a 3rd pairing on defense which was badly exposed during the SC finals. David Schlemko is a surefire improvement over leaving Roman Polak, and (he) might be able to put himself into a top4 conversation, too. Had he signed for one year less, the deal would have been almost perfect. That’s just the price Doug Wilson had to pay, though. Schlemko was brought in as a late addition to be a depth guy. However, he emerged as a solid, all-around top-4 blue liner. Devils took a flyer on the puck-moving defenseman and got rewarded. Any given team could have had him for pennies but instead often opted for a much worse (and much more expensive) option. As the picture suggests, Devils were a much better 5 on 5 team with Schlemko on the ice. Devils generated more offense, shots and scoring-chances with him. While on the PP, Devils generated more scoring chances (per/60) with him on the ice than any other d-man on the team. And it wasn't particularly close. Schlemko managed to produce 50.31 shots-for (per/60) and 92.46% on-ice corsi-for percentage. 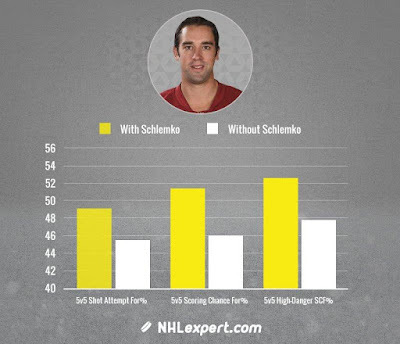 In comparison with John Moore, who was also given a fair amount of PP minutes (101:22 TOI), Schlemko looks superior. Moore managed to squeeze just 37.88 SF and 66.89% corsi-for. The truth is Moore was used primarily as a 2nd unit point-man while playing with weaker quality of teammates but Schlemko performed very well during his tough minutes. In saying that, he was equally impressive defensively as well. On the penalty-kill, Schlemko ranked 1st among Devils D in shot attempts allowed (per/60) and even ranked 1st in shot attempts for (per/60). Schlemko has really matured during his past two seasons. He was solid during his short stint in Calgary as well. In essence, Schlemko can definitely hold his own during 5 on 5, should be able to carry a 3rd pairing and move up the depth chart if necessary. Remember, the player usage charts reflect a weighted average of the previous three seasons. As a result of that, Schlemko finds himself on the right (suggesting an offensive role) while facing a weak quality of competition. It’s more of a reflection of Schlemko’s Arizona/Dallas/Calgary days than a reflection of his true abilities. Regardless of what you think, Schlemko’s big shaded circle suggests he has been an effective defenseman who might be ready for more if assigned a more challenging role. The A.Greene-Larsson pairing was given all the tough assignments which gave Schlemko and company a little breathing room. 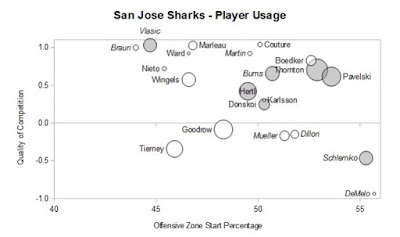 Schlemko might find himself in a similar situation in the SJS: the Vlasic-Braun combo is arguably the league’s best shutdown pairing. 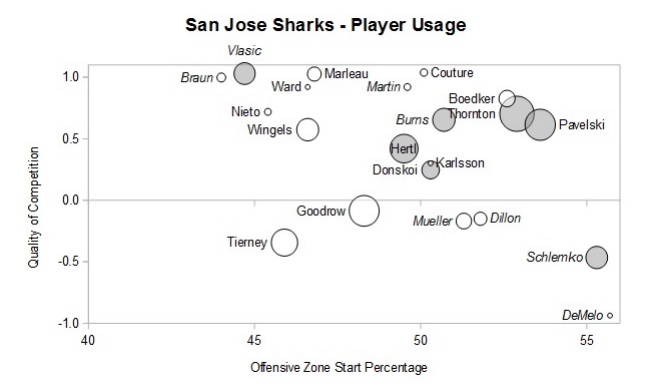 Then there’s that Brent Burns guy… Paul Martin is still a reliable, shutdown top-4 vet, but it makes you wonder how much he’s got left in the tank: especially after taking into account he recently turned 35 and played 100+ games last year. Schlemko might give Pete DeBoer another decent top4 option. Either way, Sharks’ defense can definitely match up against the league’s best and David Schlemko should be a positive producer in the #4/5 slot.